With Mac upgraded to its latest operating system OS X El Capitan, the groundbreaking features and beautiful designs have attracted more users to enjoy photos on it than before. In daily life, we often take photos with our Android mobiles, while it is always a headache when we need to transfer photos from Android to Mac OS X El Capitan. If you’re using Mac and need to transfer photos to it, this post will do you a big favor by guiding you on how to do it. This online app is a perfect mobile device management software, which allows users to manage their files without using USB cable. With WiFi, you can move your Android photos to Mac at a quick speed. Now follow steps below to see how it works for you. Click the download button below to install it for your Android. Or you can Search “AirMore” on Google Play store. 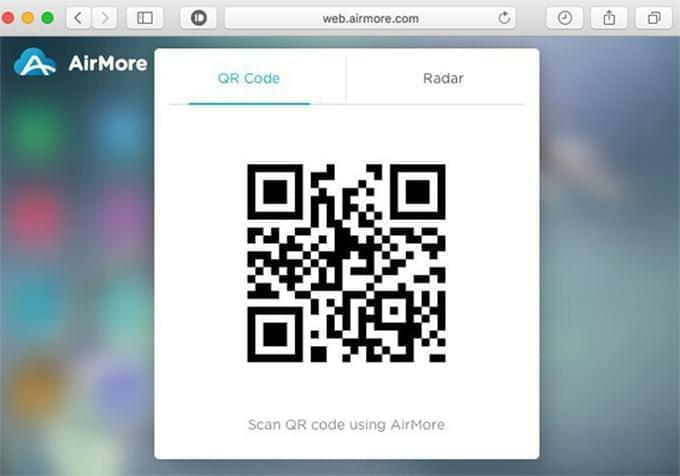 Visit AirMore Web on Google Chrome, Firefox or Safari. Run this app on your device. Click “Scan to connect” to scan the QR code on the PC web. Another way is to hit your Android in Radar. In order to activate successfully, you need to put your phone and PC under the same WiFi. When the main interface pops up, tap on “Pictures” icon and you can see all photos stored on your device. Choose those photos you want to transfer and click “Export” button on the top to copy them to the Mac. This online app also functions well in other aspects. You can use it to display any Android photos on the web. If you want to delete some unwanted photos, just erase them by clicking the “Delete” button to free up your Android space. What’s more, this tool also works on your iPhone. For example, you can use it to transfer files from iPhone to Mac OS X EI Capitan. Android File Transfer is another good application allowing you to browse and transfer files between your Android devices and Mac. It is a small-sized app, but it takes patience when installing it on your Mac. The biggest disadvantage of this tool is that you can only use it to transfer files no more than 4GB. When you click the download button on its official website, you actually get a compressed file. You have to uncompress this folder to find “Android File Transfer.app” and then drag it to the “Applications”. Once installed, you need to connect your Android with USB cable. Usually photos are saved either in the “DCIM” folder or the “Pictures” folder. 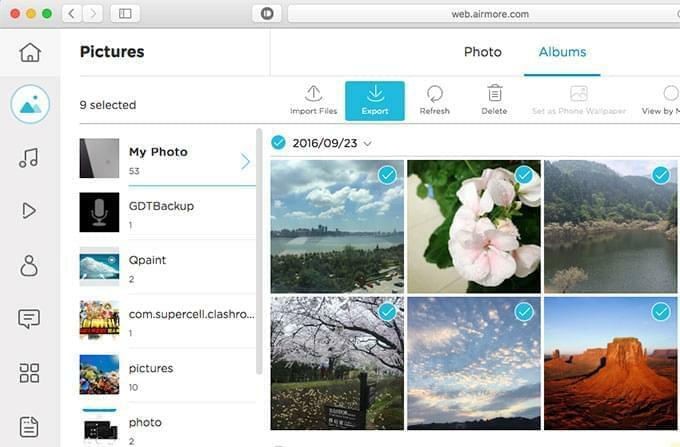 Preview the photos before using drag & drop function to transfer pictures from Android to the Mac OS X El Capitan. If you happen to not have no USB cable in hand, AirMore is a perfect choice to move files between Android and Mac. 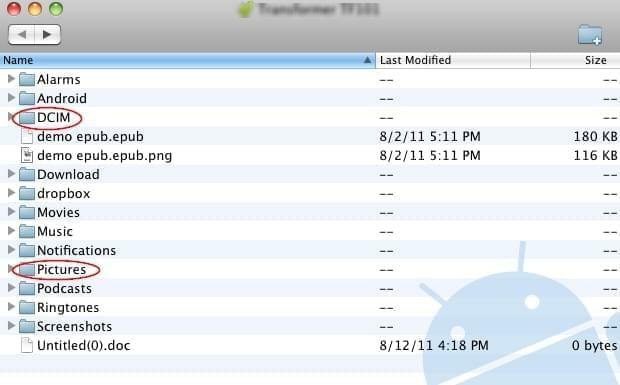 If you only want to transfer small-sized file to your Mac computer, Android File Transfer is a good alternative for you. Rating: 4.3 / 5 (based on 46 ratings) Thanks for your rating! this is a awesome tool, very user friendly and quick. Hi, please go to the Settings of your browser and see what is the default folder to store your downloaded files. 5 stars!!! i finally got it to work and I am on DSL! I was unable to select all and it wouldn't work. selecting it bit by bit worked like a charm!!! "Unable to expand file" THe file appeared in documents not in pictures as I selected. I can't see any pictures!!! HELP! Where do I find the pictures? No airmore icon at top left either.